Gleann Cholm Cille (Colm Cille Valley) is a broad and secluded glen in western Donegal with one of the finest collections of pillar stones anywhere in Ireland. These are spread over a wide area of the valley floor and are located at the fourteen stations on the 3.4 mile (5.4 Km) route (there is also an alternative 4.5 mile route). 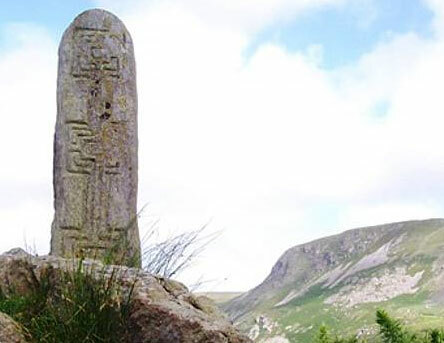 Turas Colm Cille is the name given to this pilgrimage path located in Gleann Cholm Cille. An Turas is conducted by locals and visitors alike annually on St Colm Cille’s day, June 9th, ‘An Turas’ is performed barefoot around 15 standing stones and Cairns including the saint’s own Church and Bed as well as the large Cairn at his well. It takes around three hours to complete and the first Turas is usually performed at midnight of ‘Lá an Turais’ (Day of the Journey). Although some of the stations can be visited all year round, the practice of pilgrimage is based on the willingness of local landowners to allow pilgrims to enter their lands on Sundays between June 7th and August 31st each year. The pilgrimage itself takes place annually on July 9th, the feast day of St. Colm Cille. Participation on the day is an uplifting experience, bringing one back into the atmosphere of the old Irish pilgrimage as practiced a thousand years ago. Tá Turas Colm Cille suite i gcroí-lár Ghleann Cholm Cille agus siúltar é cosnocht ar an 9ú Meitheamh gach bliain. Tá 15 stad ann agus a gcuid paidreacha féin le rá ag gach ceann acu. Tógann sé tri huaire a chloig leis an Turas seo a dhéanamh. Not only are prayers recited in beautiful Donegal Irish, but each station has its own dignified and time-honoured ritual. For example, the pilgrim must lie down on St. Colm Cille’s bed and turn over three times in a recumbent position before taking some earth from under the bed, while still lying down, as a protection against fire and a cure for other ailments. 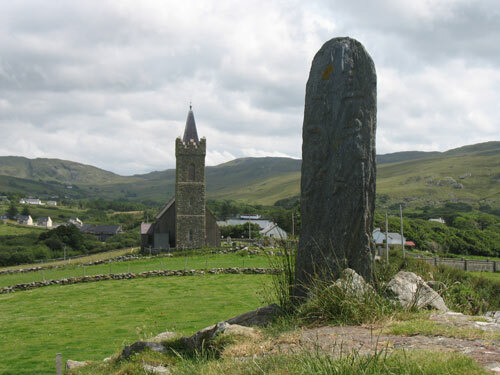 The pilgrimage traditionally starts at the nineteenth-century St. Culumba’s Church in Gleann Cholm Cille. In due course, the route proceeds to Beefan, the most westerly point on the route. From Beefan, the pilgrim begins the return journey down Mullach na Cainte, ‘the slope of conversation’, traditionally the only place along the route where pilgrims are allowed to talk. The route then leads through a marsh – where exposed pavement stones may have formed part of the ancient pilgrimage road – and returns to the starting point via Drumroe.